Sinai – the classic Jewish paragon of the revelation that comes down the mountain.It’s sort of like religion’s very own form of trickle-down economics.G-d drips law to Moses who drips it to Joshua, to the elders, the people, and it has been tripping down the slopes of history and humanity ever since. We are the blessed recipients of this lineage – this line of descent from mountain top to bottom. Revelation in the language of lines. Of course, one of the core ideas in Kabbalah revolves lines…and circles. Yosher and iggul. Line consciousness (yosher) is masculine, while circle-consciousness (iggul) is feminine. Revelation at Sinai, I would augur, is more of a line oriented revelation, of wisdom that flows from above to lineages below. And yet as essential as Sinai is to our tradition, Judaism also offers us more circular, more feminine, models for revelation. The Talmud (Niddah 30b) shares a poignant image wherein each of us receives the entirety of Torah…while in the womb. There is a candle lit above our invetro-souls and in the drench of that lamp-light an angel teaches us Torah, all of it. At our destined hour of birth that self-same angel touches us above our lips, creating the gentle slope indention known in anatomical parlance as the philtrum. With that touch we forget all that we have learned in our 9-month tutorial. Life sprawls out before us as an on-going uncovering of all we have forgotten. Each piece of Torah learned is thus imbued with a striking sense of deja vu, of resonance with a truth we once knew. Torah learning, according to the Talmud’s model, is more of a dis-covery, re-covery, than a downloaded hand-out from above. Isn’t it lovely that the Hebrew poetry of the word for pregnancy, b’herion, begins with the letters ‘b’har’ meaning ‘on the mountain’. Mother’s mountainous belly and Mount Sinai are like parallel locals of highest…or in this case, deepest, revelation. And so I want to offer up this image of the Sinai of the womb. An image of revelation not via descending line, but rather in a circle; revelation in the encasing round of the womb. Here wisdom does not so much trickle down as it gets uncovered from deep within. It is well-planted in our sub-conscious. So essential to who we are that we have ‘forgotten’ it. For it is lodged in that place where we were once in oneness,utterly merged with mother. And yet, we can bring that forgotten wisdom back into consciousness. I see it happen every day while doing therapy with individuals who take the time and space to access their own deepest selves. In that inner anchoring they uncover storehouses of wisdom…they enter the circle of their very own inner-revelation. This is the wisdom we are reminded of each time we look another in the face. For there we meet the philtrum, that indented reminder of all that we have forgotten; an embodied emblem of the Sinai of the womb. A memento of the depth Torah, the knowledge, that each of us has carefully tucked away. It reminds us that we have forgotten. It reminds us that our revelations are within our reach; that the wisdom we seek is already here, planted deep within. In that spirit I share this prayer to the Angel of Forgetting – that we will each be able to uncover the deepest of revelations; to recall the Sinai lamp-lit teachings of the womb. And more than to just remember, but also to find the ways to relay that inherent knowing out into a world so out of touch with it’s own fathomless & forgotten truths. 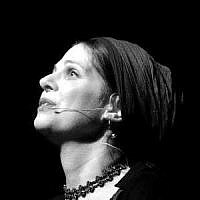 Psychotherapist, performance artist & Co-Director of Jerusalem's Shalev Center. Maybe you've seen her one-woman show "Babel's Daughter"?... Maybe you will soon. Chaya lives in Nachlaot with her husband R'Hillel & their three energetic children. Her motto is, "Every mess is Messianic."